Rory McIlroy will become only the sixth man to achieve a career grand slam if he wins the US Masters next Sunday (Picture: Nick Potts/PA Wire). Being the youngest of the four majors does not prevent the US Masters from making a big deal out of its traditions, so much so that the phrase ‘A tradition unlike any other’ has been trademarked by Augusta National. Often used by CBS announcer Jim Nantz, it is a phrase usually taken to refer to traditions such as the honorary starters, the par-3 contest and the green jacket awarded to the winner at an iconic venue. But perhaps it can now also refer to the annual question of whether Rory McIlroy can join golf’s most elite club by completing the career grand slam. McIlroy needs to win the Masters to join Gene Sarazen, Ben Hogan, Gary Player, Jack Nicklaus and Tiger Woods in having claimed all four major titles. The 29-year-old has finished inside the top 10 on each of his last four starts at Augusta National and was in the last group in the final round 12 months ago only to struggle to a closing 74 and end up six shots behind playing partner Patrick Reed. McIlroy started the round three shots behind Reed, who bogeyed the first and failed to birdie the par-5 second. McIlroy had an eagle putt from four feet on the same hole to tie for the lead, but missed and bogeyed two of the next three holes. However, there is also no question that McIlroy travels to Augusta in some of the best form of his career after following five consecutive top-six finishes with victory in the Players’ Championship. The one downside is that only Woods (2001) has won the Masters and Players’ in the same year, but McIlroy insists he has already come to terms with the size of his task in completing a career grand slam. “I’ve become a lot more comfortable with the fact that I’m going to fail more times than I succeed at that certain conquest or whatever you want to call it,” he said. Time is something that is not on the side of 43-year-old Woods, who knows all too well that Nicklaus is the only player to have won the Masters at an older age. Spinal fusion surgery in April 2017 was Woods’s fourth back operation in the space of three years and surely a last roll of the dice, but it was a gamble that appears to have paid off. Woods could only finish 32nd last year at Augusta, but ended the season by winning the Tour Championship in Atlanta and made an encouraging start to the season before missing the Arnold Palmer Invitational with a neck problem. After beating McIlroy in the last 16 of the WGC-Match Play, Woods lost to Lucas Bjerregaard in the quarter-finals, but with the hype which surrounded his Masters return last year turned down a notch that is likely to work in the 14-time major winner’s favour. Elsewhere, Reed will try to emulate Nicklaus, Woods and Nick Faldo as the three back-to-back Masters champions, although current form suggests he is more in danger of being the third straight defending champion – after Sheffield’s Danny Willett and Sergio Garcia – to miss the cut. 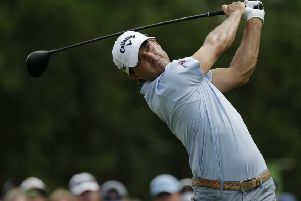 Garcia famously took 13 shots to play the par-5 15th in the opening round last year and has made more headlines this season for his disqualification from the Saudi International and rules row with Matt Kuchar in the WGC-Match Play. In a season dominated by issues with the new Rules of Golf, it would be no great surprise, if decidedly unwelcome, for another problem to arise at Augusta. Club chairman Fred Ridley was involved in the incorrect drop taken by Woods in 2013, the same day that Chinese teenager Guan Tianlang was penalised for slow play. It would be a brave official to penalise Woods with his fifth green jacket on the line. But in 2019 nothing can be ruled out.